From Somerset, go South on Highway 27, in Burnside, at the flashing yellow light, turn left on to Antioch Street. Immediately after the passing under the Railroad Bridge, turn right onto Antioch Road. This road will Y, at the Y bear left, that is Antioch Church Road and then turn onto the second street on the right which is Lakeshore. 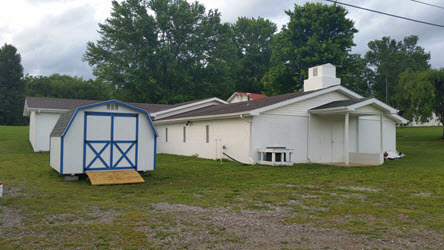 From the corner of Lakeshore and Antioch church road you will see the back of the church building and an lp gas tank in the yard. The building is a single floor white concrete block building. Parking is available in the front of the building.